I am continuing my mission to get caught up with the writing projects and podcasts. Sometimes it just flows out of me, other times I need a sledge hammer and crow bar to get a sentence out! I remain committed to sharing this wonderous journey, so others might benefit along with me, the magic in discovering things through experience. The break from constant moving has been good as I gear up for the next leg of the journey. Northern Europe has windmills scattered across the countryside. 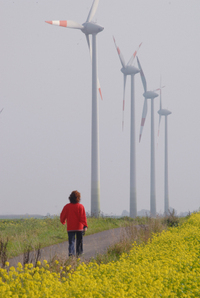 They stand as a testament to finding a way for renewable energy. Thank you for the post on my blog! It has been so much fun to have you and the students of Highland along on this journey. I am really looking forward to my visit to Highland, it is going to be a very special time together! Thank you for the post on my blog. I hope one day you get to travel too! When you do travel, where will you go explore? My favorite part of being with the gorillas was watching the little ones wrestle and play. Africa has so many different and amazing kinds of animals, making it one of the best places in the world to see wild creatures. I’m happy to have you along for the journey. I’m in Germany right now, it is a very nice place. Not so many wild animals though. Thanks for the post on my blog. Yes, I am in Germany as I write this to you! How cool is that? I am here to give presentations to students about my journeys. No, this time I don’t have the time to play any games, bummer. You are welcome Andy. Do you want to travel one day to new parts of the world? Today you came to our school in Heinsberg and I have to say that it really inspired me. I must say that I'm pretty jealous because you've visited so many beautiful places and got to know new people and I would love to do the same. It's not just traveling that really attracts me ( New Zealand would be a place I would love to see )but also this connection to people. Even if you don't understand a word the other one says there is still a way to communicate and this is one of my dreams - to do excactly the same. All over the world people are just like us and I think it's kind of amazing to get to know them and their oppinion about the world. Well I think I'm not that good telling you all this in English but I had the feeling that I had to write you something because today made me realize what's really important for me. Thank you for this! As we say in Germany sometimes: You always see someone twice! And I hope that someday I will see you a second time and that I'm able to listen to your stories again. Today you was in our school in Heinsberg (Realschule). Maybe you remember me i'm that one with a Mac,too. Your programm was great, really great. The fotos and your stories. This all was a wonderful combination to imaginehow the other counries are. And how beautifu, interesting and exciting they are. I really enjoy your program and it's really sad that we see only once in our life. My name is Andy. We saw the Mountain gorillas pod cast. I liked it. I heard that you are going to Germany. Why are you going there? Are you going to play any games like soccer? I heard that Germans play soccer a lot. Thank you for sharing the world with us. My name is Isabel. I love your website.I wish I could be with you right now. I love everything about traveling. What is your favorite part of the gorillas? Were there a lot more different animals in Africa? Thank you for making a website. Also, I have a grandpa that is from Germany. Another great group of students is ready to type their letters to you. We really appreciate the time you take to write back to us. Thanks for sharing the world with us! I would love to hear from you one day after you ride the camels! Good luck with the class, I look forward to reading your blog posts. It's me Brittany again.I would like to ride the camels in Sudan just like you.You know Mrs.Tharp-Lumley right,well she is holding a class and we are going to go on your website and write to you a lot.I think I'm going to do the class.It really sounds fun.I hope you will write back!!!! Heinsdberg is a great school, thank you for your kind words! All the best to you and your school community! Thank you for your post! The students in Colorado have been so good about sending questions, this is very cool! I'm in Denmark for Halloween, It's not a big holiday here, very quiet. I'm currently staying with a friend in Copenhagen that I met in Egypt in 2002. So, yes, I make friends as I travel and we keep in touch. The Russians are making me wait because that is what the US government does to Russian citizens who want to visit the US. I am a student from Heinsberg and I listened to your report. It was really great and I liked it! I hope you have a great time and maybe we will meet again, if you visit Heinsberg. Where are you going next? I am really excited that you did not see any crocodiles. I really like your Blog site because it is fun to read and has cool stuff. What are doing for Halloween. Where will you be? Is Halloween even a Holiday where you are at or are going? I am going trick or treating with my Brother. I learned about your journey through my school. Why do you have to wait for a VISA? You are very very cool. Have you met lots of friends around the world and do you keep in touch with them?